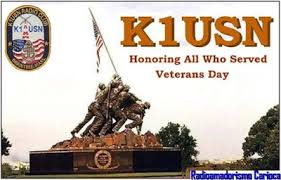 The K1USN Radio Club will once again be on the air to celebrate Veterans Day as we take time to show our appreciation for those who have served; as well as their family members. Local hams are invited to visit us in Braintree, MA at 85 Quincy Ave.
SSB – 3860, 7260, 14260, 18160, 21360, 24960, 28360 and 50160. CW – 3539, 7039, 10109, 14039, 18079, 21039, 24899, 28039 and 50109. K1USN QSL cards will be available for all contacts with K1USN. Send # 10 SASE to K1RV or DX stations QSL via bureau.